I especially foodie element of Christmas, where you bring out all your fine gourmet food. I usually make toffee/caramels that are frequently requested. This year I’m adding a few other things that is inspired from my travels, to my Christmas goodies list. 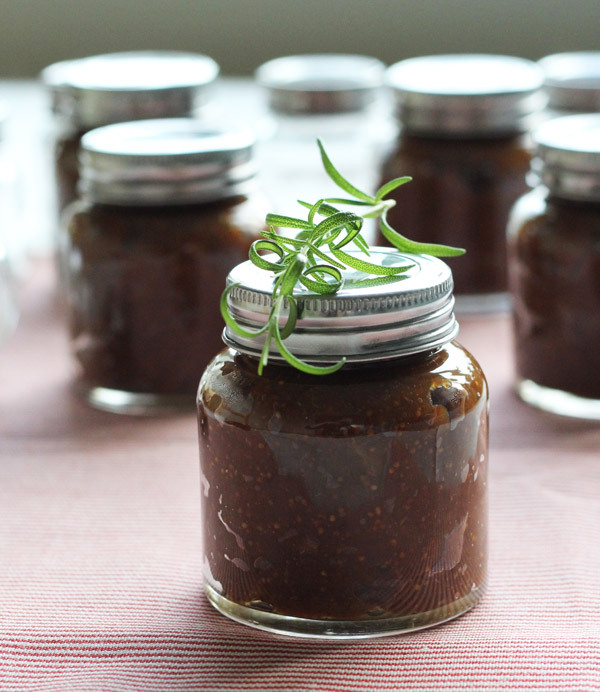 This is a luxurious, rich and slightly boozy fig marmalade with cognac and rosemary. It’s inspired by long, hot aromatic summer days by the Adriatic sea. You can of course replace the cognac with another liquor or even a nice white or red wine could really take this marmalade to new heights! Remove the twig from the figs. Chop finely. Juice one orange, and cut and slice the other orange as thinly and small as possible. Add figs, orange juice, orange, lemon juice, lemon zest, salt and pull away the rosemary leaves from the twigs and add to the pot. Add 5 dl of water, or until the surface of the fruit is covered with water. Let simmer on low heat with a lid open about 2-3 cm for about 2-3 hours. Stir occasionally. During this time, add more water if needed. Add sugar and cognac, let dissolve with the fruit and add more water if needed. Let simmer gently on very low heat without a lid for about 30 min to 1 hour. Stir often. Once the fruit is dissolved and you have a thick and glossy texture of the marmalade . Remove the pot from the stove and let cool off. If you want a smoother marmalade , process it with a hand blender in the pot. Place in sterilised glass jars. Which you then add to a pot of boiling water for about 5-10 minutes, depending on the size of your jars. To preserve. Store in a dark and cool place until it’s time to use.